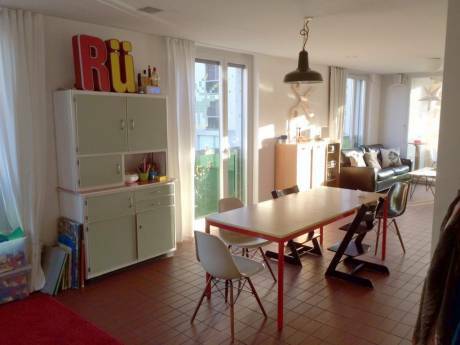 The spacious and bright apartment is situated on a quiet street in the most fashionable area of Zurich city. 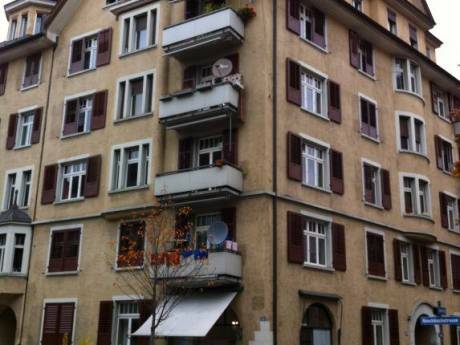 Its an old building with direct access to the board-walk and the lake of Zurich. The apartment has original oak-flooring, very high ceilings, lots of big windows and 3 balconies. The living-room is very large and sunny. One part is the lounge-area with a Bang&Olufsen T.V and the other part is a library with a day-bed. The living-room has access to a balcony with view of the lake. The kitchen is recently renovated with modern equipments and has become a very spacious and beautiful room with a long dining-table designed by Natanel Gluska, seating 12 people and made of one piece of Oak-tree. Behind a black-board sliding-door you will find the washing-machine & dryer. The kitchen has also a court-yard balcony. The apartment has two very big bedrooms, both with king-size beds. Master bedroom has direct access to a cosy and private balcony with a view of the lake. The bathroom is also recently renovated and has an oversize shower. The apartment has been featured in many interior-magazines around the world. We are two friends charing an apartment. We are both successful and international women (Norwegian and Portuguese but lived all around the world). We are in our 40 and we who love to travel and explore new parts of the world with (or sometimes without) our partners. We are very easy-going and responsible. Because of our busy schedules and intense work we are mostly interested in short-term exchanges. Even thou the apartment is in walking-distance from the most buzzing shopping-streets of Zurich the area has a sense of residential quietness. Being so close to the lake makes it feel like you live in a park. 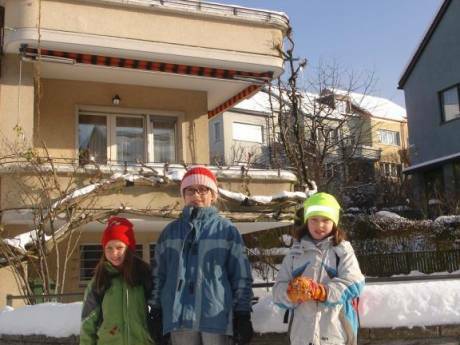 The apartment is also situated 5 minutes walking-distance from the train-station with really good connections to the mountains and also within walking-distance we have access to the old steam-boat for picturesque trips around the lake. The neighborhood is full of nice bars and restaurants with international and traditional dining. The area has also farmers market on Tuesdays and antique markets on Saturdays. You don't need a car in Zurich (15 minutes from the airport directly with the train) but if you decide to bring a car there is a private parking in front of the apartment-building.